an open spaces plan, and beautiful, yet durable flooring. Barrington area residents Claire and Steve Baker bought their 1980s Colonial home for raising their family. Now that two of their three children have grown and are both getting married this year, the couple decided to update the home, focusing on the master bathroom, kitchen, and family room. By opening up rooms to connect on the first floor, there would be more flow-through and space to entertain in for the upcoming weddings and other family events. They also realized that thoughtful updates to the home would help to sell the home, later on. Claire’s interior designer is Lori Vieceli, a long-time friend she’s known since both her daughter and Lori’s were in kindergarten together. The challenge before them was to open up the boxy, closed-off rooms typical of a 1980s Colonial home design. A separating wall between the kitchen and family room was removed, a header was lifted into the ceiling, and the rooms were repainted. Homeowner Claire Baker visits with interior designer Lori Vieceli in her newly updated kitchen. The kitchen layout was re-arranged and a center island removed to create more space, with the sink being placed in front of a window. The kitchen layout was opened up into a “C” configuration to accommodate more open space. 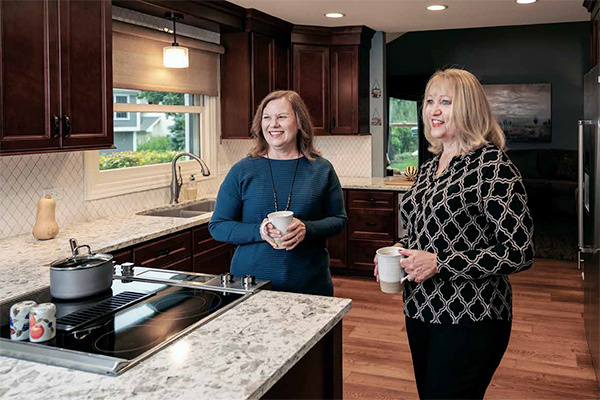 Claire did not want a hood for ventilation in her kitchen, so Lori chose a Jenn-Air stove with a drop-down vent that stores inside the stove. The kitchen and family room were connected into an open floor plan, using flooring throughout to unify the space. Lori guided Claire to find the right flooring from Yonan Carpet One. To withstand high traffic and the family dog running around, a luxury vinyl tile with a wood-like finish was chosen for the entire main level, and a custom rug and pad from Yonan is placed in the cozy family room. “Lori is a friend, but she is also an expert interior designer,” Claire said. “She always answers my questions, even the smallest ones. She managed all the vendors and contractors and offers a large and long-term network of skilled professionals that worked with us.” Lori considers many factors when working with a client, including any medical conditions, which way doors should open, which hand a client uses to reach for things, and even aging-in-place considerations. And of course, price points are a top consideration for her clients’ projects. The Bakers asked me for a room where they could have family gatherings, and spend time with friends. In 2012, we left the existing carpet with a future plan of removing it when it was time for the kitchen remodel. When Claire called and said it was time for the next phase, we were happy to help. While the family room design plan and furniture continued to serve their needs, it was time to replace the flooring. The new flooring selections would need to coordinate with the new kitchen and blend with the existing wall cabinets in the family room. Additionally, it needed to be pet friendly, cozy to sit on, timeless, low maintenance, and remain looking great in 10 years or more. I needed flooring that was up to the challenge. I selected luxury vinyl tile (LVT) and added a custom rug and pad. Before I could select the flooring, the kitchen needed a new space plan. The window was near the far corner of the room which concentrated the light on the end of the room, leaving the remaining work area dark. We moved the window down the wall, allowing the light to flow evenly through the work area. This allowed her to move the dishwasher to the right side of the sink, which was more convenient for a right-handed family. The refrigerator was close to the family room entry and made passage impossible if the refrigerator was in use. We removed most of the wall creating an open concept between the family room and the kitchen. The refrigerator was moved down the wall making space for a beverage bar next to the family room and creating a larger walkway. After making the changes, the flooring could flow from kitchen to family room creating a more unified space. The LVT was an excellent choice for this kitchen because it is not as hard as tile and it keeps a constant temperature year-round. It is comfortable to stand on for long periods and is low maintenance. One of the best features of this floor for the Bakers was that it resists scratches from their dog and will remain beautiful for an extended number of years. 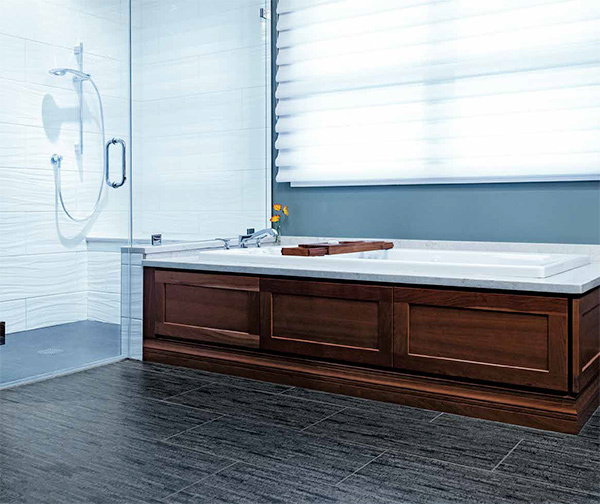 The master bath has several tile selections that are stylish and low maintenance. The porcelain floor tile coordinates with a coffered ceiling that was added during the remodel. The color of the coffered ceiling blends with the tile to give the room balance, depth, and visual interest. The wall tile in the shower has a beautiful glossy finish shower. The shower bench, the top of the tub surround, and the vanity counters are quartz. The tile, paint, and quartz were carefully coordinated to give all the layers in the room visual interest while keeping the room feeling restful. Lori Vieceli finds that a majority of her clients think analytically. They are looking for someone creative in addition to being mindful of the planning and budgeting of the design project. Lori works with clients to develop a budget, so they are aware of what the costs are before their design project begins. For such a creative process, Lori is very logical and systematic in her approach. 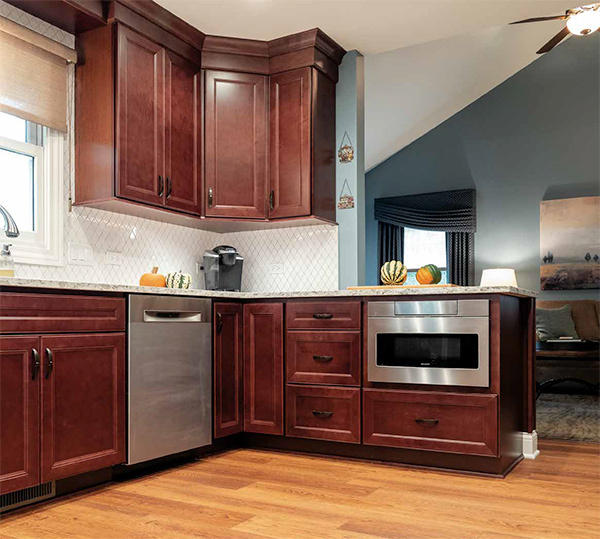 When Lori works with a new client, she discusses their likes and dislikes, and how they hope to use the space after the remodel is completed. Lori looks to maximize the space and make any adjustments. If the room doesn’t function properly, the client won’t like the room no matter how well-decorated it is. Correcting the negatives and paying attention to details will make the room a success. 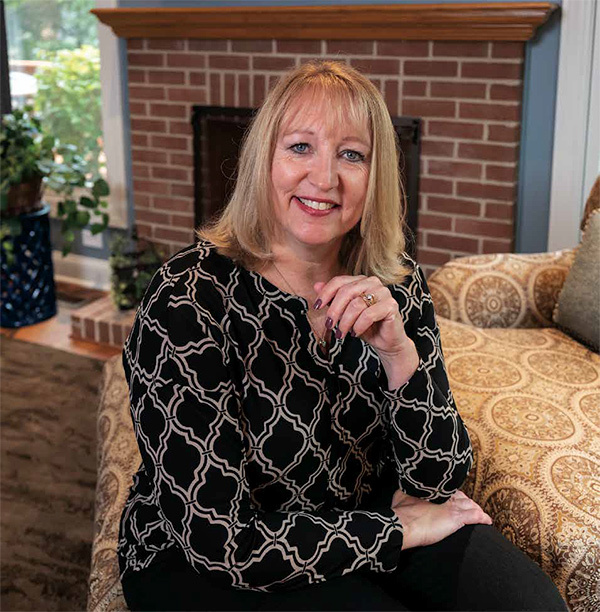 Lori is an award-winning, credentialed designer with 30 years of experience and is a Professional Member of the American Society of Interior Designers for 23 years. 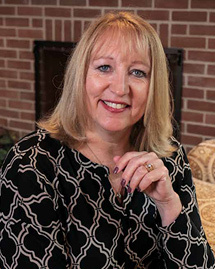 She works with clients in the Barrington area and Northwest Suburbs. For more information email to Lori@VieceliInteriorDesign.com. To get your free report on “The Top 10 Mistakes to Avoid When Remodeling Your Kitchen”, go to www.VieceliInteriorDesign.com. Yonan Carpet One Floor & Home is located in Palatine/Rolling Meadows, Downers Grove, and Oak Park/Chicago. 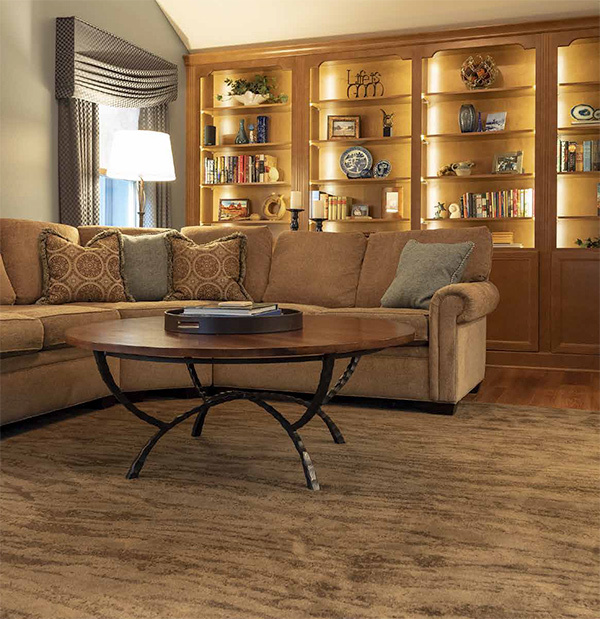 They offer carpet, hardwood, area rugs, and luxury vinyl plank. To learn more, visit www.YonanCarpetOne.com.